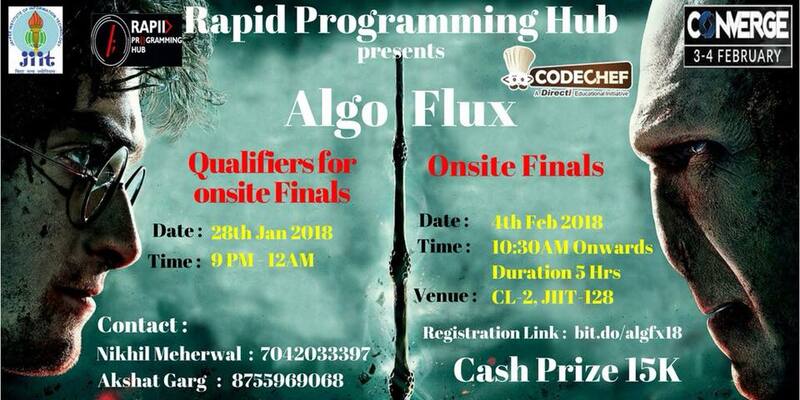 We invite you to participate in Algoflux 2018 - The Annual Flagship event of Rapid Programming Hub, Jaypee Institute of Information Technology-Sector 128, Noida. It’s going to be a 2-phase contest-Qualifiers and Onsite. According to the performance, teams will be shortlisted for Onsite Finals. 1- Registration for Online Qualifier closes on 28th Jan at 6:00 PM. 2- Duplicate Registrations are not allowed. 3- Duplicate Submission and Code Sharing is strictly prohibited, any instance of it would lead to disqualification. 4- Top 3 teams will be awarded. 5- All students with valid student identity card of their respective Educational Institution are eligible for participation. Kindly Register Here For Participating . Note: Contest Link will be provided after team registration.